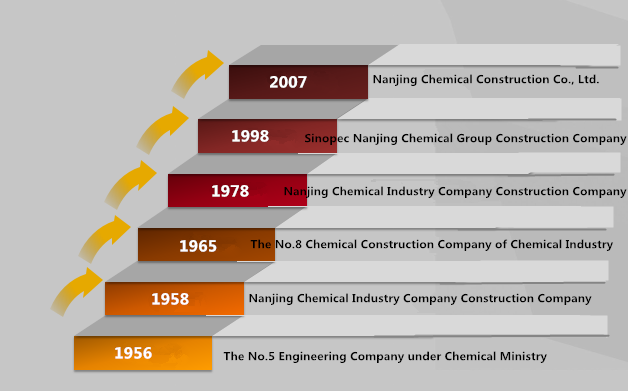 Nanjing Chemical Construction Co., Ltd. was established since April 1956, and was the former Shaft Engineering Company directly under the Construction Bureau of Ministry of Heavy Industry, the No.5 Engineering Company under Chemical Ministry, the No.8 Chemical Construction Company under Chemical Ministry and the Sinopec Nanjing Chemical Group Construction Company. Over the past 60 years, NCC has undertaken over 600 large and medium size projects at home and overseas with our footprints left all over 39 Provinces, Municipalities or Autonomous Regions at home and more than ten countries across the Asian, African and European Continents. NCC is a National Excellent Construction Enterprise with more than 180 awards in international, national and provincial level and has been rewarded for straight 20 years as Contract Honoring and Creditable Enterprise with AAA Credibility and A Tax-paying Credibility by the government department of Industry and Commerce. NCC head office has 11 functional departments and has 38 regional sub company, project management team, enterprise sub company, branch and plants.